With our Cherished Memories Child Bronze Gravestone for the cemetery, you can memorialize your loved one forever. Our Bronze Grave Markers come without a Vase. Here you have the choice of adding one of our magnificent bronze vases to your grave marker; there are four styles to choose from. The bronze vase color will be matched to the bronze color selected above. All vases can be turned upside down when not in use. Please provide any instructions for us in this field and we will try our best to accommodate those instructions. "The granite and bronze marker is beautiful. It exceeded my expectations, and was a great value. I truly appreciate my dealings with Memorials.com. They where the epitome of professionalism, showing every courtesy and respect, my sincere thanks. 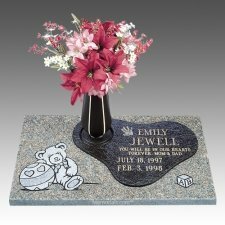 I would not hesitate to recommend Memorials.com. I was in no way disappointed by my experience. " Toni B. "On the 8th month anniversary of my son's (age 31) passing I finally found the perfect urn to use as his final resting place. We are able to keep him near us in a tasteful setting. "